The first thing I learned about Walter Bimson was that he was a Phoenix banker who in the late 1950's built himself and his wife a sprawling 4,000-square-foot house, with a yard, a white gazebo, a terrace, and a nice patch of grass. Not so unusual for a civic booster. Of course he would want to demonstrate his roots in the community; of course he would want to spread out and show off. The strange thing, though, was that Bimson's rather large house sat on the top floor, the ninth floor, of the Phoenix Security Building at 234 North Central, amid all the other highrises in the downtown corridor. This penthouse doesn't seem very bankerly, but that's just where it starts. Just to call Bimson a 'banker' is like saying that from time to time the sun influences the weather. Bimson was an early transplant from Chicago, around 1930, and with his brother Carl he founded the Valley Bank and Trust, later called Valley National Bank. The explosive expansion of Phoenix in the postwar years wasn't an accident, it was his strategy. Beginning in 1933 Walter Bimson had aligned the fortunes of his Valley National Bank (VNB) with the growth of Phoenix, and by attracting Motorola and other industries, instituting a liberal lending policy and a longstanding public relations effort to paint The Valley of the Sun as a paradise for elderly mid-Westerners, he cranked up a growth machine that's been damned hard to stop. By 1945 VNB was the largest bank in the southwest. In 1947 he and the other two "Big Three" (lawyer Frank Snell and publisher Eugene Pulliam) straightened out city government, which is a whole other story. According to Hal Rothman's "Neon Metropolis", Bimson had a hand in financing the founding of Las Vegas, with a $600,000 loan from the Valley National Bank to a Mr. Benjamin Siegel that was "arranged in complicated circumstances." Take that for what it's worth. And he wrote a book on fly fishing. Bimson's summary biography is not something I'm equipped to write but that gives you a flavor. More than all that, he was a philanthropist and important art collector of southwestern art and, by most accounts, a mensch. Frank Lloyd Wright inscribed a book to him as "a humane banker -- believe it or not". Beginning in about 1960, Bimson commissioned a number of modernist VNB branches in the valley, and at least five of those we are featuring in the Phoenix metro area deserve serious attention. Collectively, they're an important part of civic history. People talk about examples of architectural exuberance as if they were random emotional outbursts, and in some cases maybe that's true. That's not true of the Valley National Banks. Bimson was not a young man in 1960 and not interested in self-expression. I believe his devoting budget for 'non-essentials' was a calculated investment exactly the same as extending a higher-risk loan. To "loosen things up," as he put it. These designs were meant to manifest a sunny, mobile, loose, carefree, and mildly futuristic civic identity, part of this long-running and large-scale and wildly successful Edward Bernays-style public relation campaign to change minds and attract Midwesterners to the Valley. Bimson arguably invented the Phoenician urban personality. These VNB branches are woven into the fabric of that urban personality and still influence underlying unexamined notions about the city among residents and visitors. The most important VNB branches, however, might be the ones that never got built. 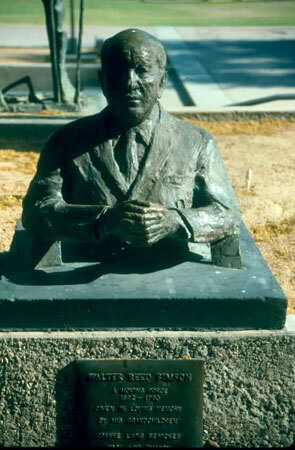 Walter Bimson, sculpture by John Waddell, photo by Einar Einarsson Kvaran.